When you pass through the front doors of the Chinese Historical Museum, the sheer abundance of artifacts makes the museum appear smaller than it actually is. A portrait of Chinatown's legendary honorary mayor at the turn of the twentieth century, Ah Quin, hangs on the left wall, watching over the exhibits with a paternal gaze. 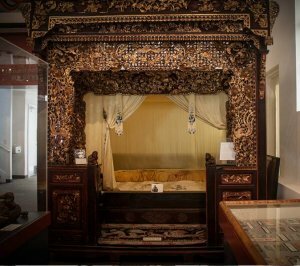 Much of the museum is devoted to rather large examples of household furnishings from days gone by including an elaborately carved alcove bed from Sichuan Province and an exquisitely decorated bridal carriage from Shanxi Province. Scale models of an early Chinese fishing village situated on the San Diego bay along with replicas of fishing boats known as junks offer visitors a three-dimensional look into the life and livelihood of early Chinese immigrants. Among these larger displays are numerous black and white photographs that take museum goers back to a time when the area was known as Stingaree (a synonym for Stingray). 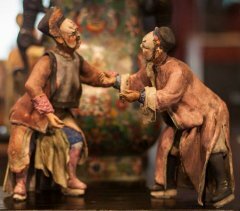 The museum host a generous number of displays of Chinese pottery, old Chinese coins and paper money, statues life size and smaller, paintings, carvings, everyday household and commercial items, U.S. military memerobilia, craft and artwork, and even old Chinese lottery equipment. Outside in the museum garden you will find lovely greenery, a koi pond and a waterfall; a perfect place to enjoy some peace and quiet downtown. On the way out, you can stop at the gift counter where you can purchase a wide variety of memerobilia old and new. For a considerable expanse of San Diego history, the Stingaree was a dangerous neighborhood notorious for its crime, drugs and prostitution. How it became so had a great deal to do with the disruption of Chinese life due to political and economic conditions. Rising anti-Chinese sentiment after the gold rush and transcontinental railway (built largely with Chinese immigrant labor) made it difficult for Chinese in San Diego to find legitimate employment or ply their maritime trade as they had done for many decades in San Diego. Chinese fishing included harvested abalone, squid and shellfish, but these items did not suit the American palate of the time so business-savvy Chinese-American fishermen sought more profitable markets in China. Citizenship was officially denied to Chinese. The Chinese Exclusion Act of 1882 barred the Chinese fishermen from re-entering the United States if their boats strayed outside of U.S. territorial waters. The Anti-Chinese Club in San Diego endeavored to bully employers into firing or not hiring Chinese workers if white workers wanted their job. Statewide, a group calling themselves the Supreme Order of Caucasians sought to forcibly repatriate Chinese back to China. Due to such pressure, the San Diego Water Company fired all their Chinese employees. At this time in San Diego, indeed throughout the West, anti-vice laws were largely unenforced and police rarely entered the Stingaree. But the area was not entirely lawless as former health inspector Walter Bellon wrote: "Chinatown did not need protection, nor the waterfront. They had their own code of ethics. Hoodlums and bouncers were everywhere, keeping an eye out for anyone who might mean trouble." At first, ignored by government officials and the police, illicit goings-on were targeted by certain churches and their followers. The San Diego Purity League sought to have all the illicit houses closed down but the city government ignored the demand. However, in light of the upcoming World Exhibition in 1915 in Balboa Park, city officials were more compliant with demands of the Purity League and in November of 1912 a judge ruled that prostitutes in Stingaree should "leave town forthwith and never return." One hundred and thirty-eight prostitutes were arrested and after a stern lecture from the Purity League, boarded a train to Los Angeles. It was a short-lived victory for the League as many of the women returned in a week's time to walk the streets outside of the Stingaree. However, by 1919, due to aggressive campaigns by the police, the health department (led by Walter Bellon) and evangelical groups, Stingaree was "cleaned up," although vice certainly did not vacate San Diego. While the Stingaree was predominantly Chinese, many other groups such as Japanese and African Americans who were socially marginalized in early San Diego resided in the neighborhood. You can learn more about these denizens of the Stingaree by taking the museum's walking tour of the neighborhood where you will learn where some of them worked and lived. The building that houses the Chinese Historical Museum has a notable history related to the develop of relations between Chinese of Stingaree and the wider community . In 1885 a young Chinese man named Lee Hong partnered with the American Home Missionary Association to establish the Chinese Mission School where attendees could take both religious and English language courses. Located at the corner of 13th and F, the Mission School was a fair distance from the Stingaree, so in 1901 the school was moved to 1st Street between Market and G. At the time of the move, dormitories for Chinese (mainly Chinese men) Subsequently, the Chinese Mission School opened a Sunday school for Chinese children—the first of its kind in Southern California. The school also functioned as a gathering space that provided a sense of comfort and community during a difficult time of discrimination and hostility toward Chinese in San Diego. The school also created a context for unprecedented constructive relationships between Chinese and Caucasians who supported social welfare efforts. In 1927 the original Mission School was razed and a new dormitory, as well as the building that now houses the Chinese Historical Museum, was built. The building was modeled on Spanish Missions of 18th and 19th century. In 1958, in part due to the long Chinese exodus from the Stingaree, the Mission building was sold to a printing house. More recently, in the mid-1980s the plans to construct high-rise luxury apartments on the site slated the old mission building for demolition. Concerned leaders of the Chinese community who sought to preserve the building and its unique history embarked on a two-year campaign to have the building placed on the Historic Register to prevent its demolition. In order to make way for the city's downtown renovation, in 1995 the entire building was physically moved to its present location on 3rd Avenue. 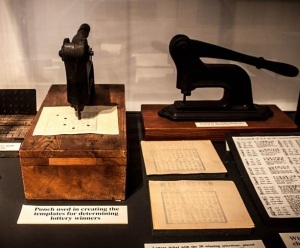 Less than a year later, it was reborn as the Chinese Historical Museum, honoring and preserving the history of the Chinese community that once existed there. In 2004, the museum purchased a building across the street on J Street where they created a thoroughly modern gallery that they call the Sun Yat Sen Memorial Extension, where in addition to the gallery for rotating exhibits, is also housed a library and lecture hall. Currently the featured exhibit is "Ah Quin: Life, Leadership, & Legacy," which recounts in photos, journal entries, documents and artifacts the illustrious life of Tom Chong-kwan, aka "Ah Quin," the aforementioned "Mayor" of Chinatown during its hay day. The gallery is actually on the same block where Ah Quin and his huge family of 12 children lived in a formidably sized two-story house. You can find out precisely where the house was located if you join the museum's neighborhood walking tour! 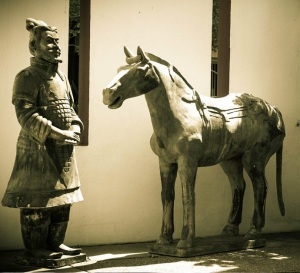 The Chinese Historical Museum and the history it embraces is one of the underappreciated cultural treasures of San Diego. Today the area is far from the bustling and colorful neighborhood that it once was. Chinese businesses and residents not longer inhabit the old Stingaree, but their history does at the Chinese History Museum. Considering the museum's entrance fee is only $2 and the walking tour is also just two bucks, this is a positively wonderful way to spend the most pleasant of afternoons learning about local San Diego history and the role Chinese immigrants played in it. Over the years we've recommended many visit the museum and take the tour—everyone comes back impressed and intrigued. Now it's your turn! Reclamation and Preservation by By Leland Saito, Ph.D.